Blog 9/Week 9: Level Design work done (again), playtesting game/giving feedback and the start of my Draft Exegesis. – Bloggity of my inner thoughts. Blog 9/Week 9: Level Design work done (again), playtesting game/giving feedback and the start of my Draft Exegesis. This week has been somewhat calm for me (which is odd, I’m usually really stressed since the due date of the second milestone is this coming Wednesday), I suppose it’s the calm before the storm but we shall see. I’m hoping it stays calm, minus the storm. Anyway, due to the time we have till the upcoming milestone, my Project Manager thought it would be beneficial that the task of doing the Level Design of the game will be a joint task between the Project Manager and myself, the Lead Designer. I didn’t have any issue with this as I thought this too is a good idea as I want to get this done ASAP. So how we split the level design work is that I did all of the texturing for the level, placed empty game objects around the terminal for the different camera angles which will be added eventually. The Project Manager created the grey box terrain of the terminal then added in the rock assets on top of the terminal to create the cave like structure. 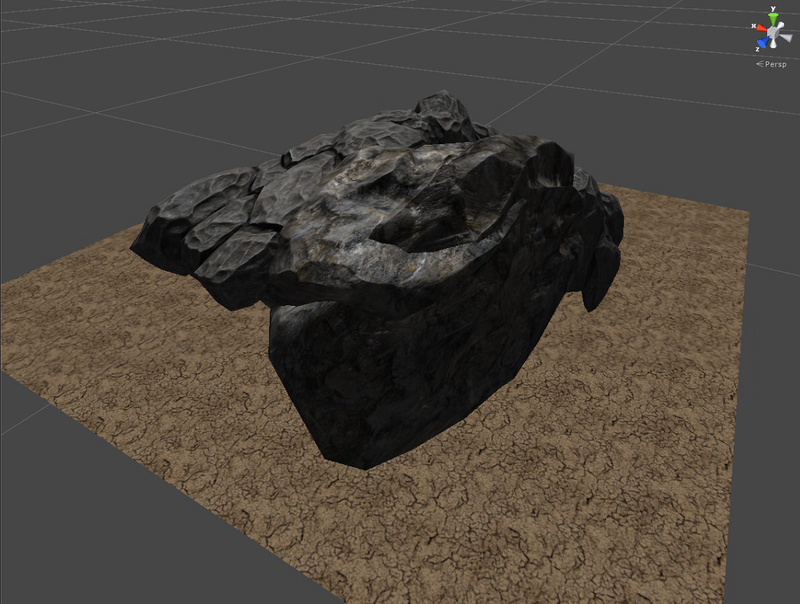 Rock assets (from the Unity 3D Asset Store) used to create the cave and a base cracked texture on the base terrain. Screenshot of a portion of the main terminal with soul portal (red circle), nodes which are the patches of the cracked texture for adding facilities (as indicated by the blue 3D model). From the feedback I’ve received from some people in our team, they have suggested that the wharves themselves (you can’t see it from the previous screenshot since it’s only showing the main terminal) need to be bigger so the level needs slight improving which shouldn’t take too long. With the textures, I have used 2 types: one of them as a baseline texture which covered the entire terrain and a secondary texture which I painted on the terminal. I textured the nodes for the facilities the same colour as the base of the terrain. The textures were not of my own creation, I’ve imported them from the Unity 3D Asset Store. 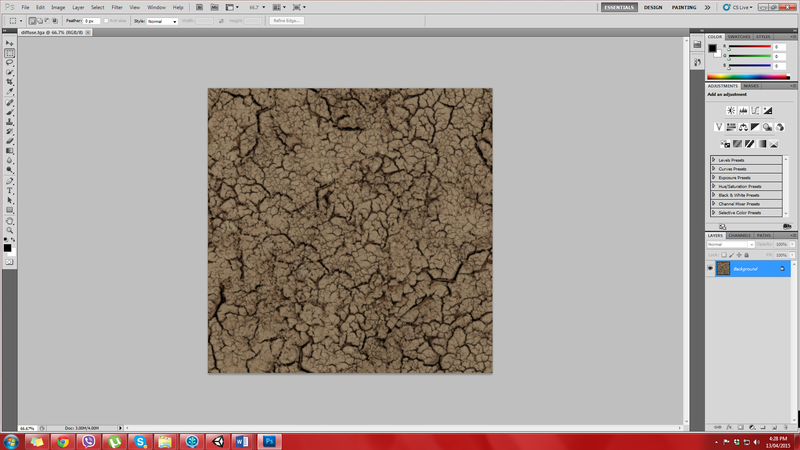 Dry Ground – diffuse.tga. 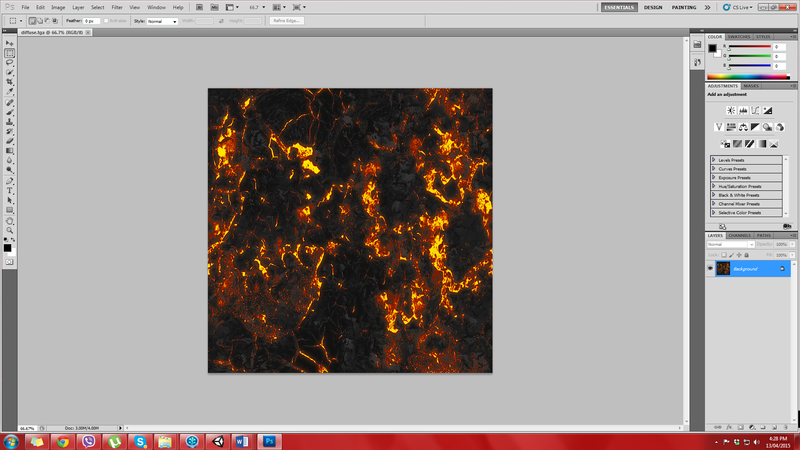 The texture I used for the base of terrain and the nodes for adding facilities. 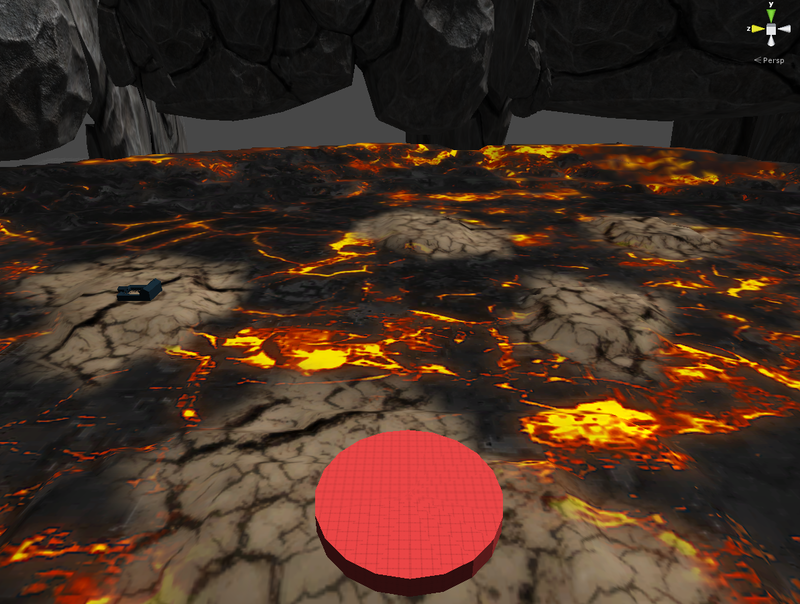 Lava – diffuse.tga. The texture I used for the terminal. I began playtesting our game in order to give some feedback to the programmers and in doing so found some bugs for them to fix. This is an ongoing process. I wrote my feedback onto a google doc that’s accessible to everyone in my team, technically this is the designer’s feedback of the game so every designer in my team should be engaging in this. So, I will be doing more playtesting after writing this blog. Fun fun. I then started typing my Draft Exegesis which a requirement for game design students as an accompaniment to our project work. For those that don’t know what an exegesis is, it’s a critical reflection on and explanation of the creative work we are doing/have done for the project. Unfortunately it’s not a shared task between the designers in our team, it’s done individually. So far, I’ve just written up some dot points (in no particular order although I need to sort that out soon so I can get my facilitator to have a look and see if I’m on the right track). So I’m thinking of writing my exegesis on 2 two topics: 3D modelling and development of Souls and Level Design. And also research/adding sources to my exegesis is a thing so I need to do that too. This will be a challenging task since I haven’t written an exegesis in a very long time and this time it has to be written in a different way! But that won’t stop me from writing it up and in saying that it will be a fascinating process. Okay, I’m gonna go do more playtesting/other work that I’ve may or may not have mentioned.